The North Carolina Literary Review (NCLR) is produced at East Carolina University and published and distributed by the University of North Carolina Press. 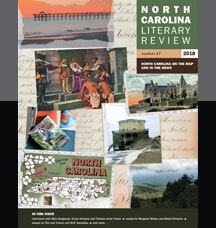 Inspired by the North Carolina Literary and Historical Association to be a companion to the North Carolina Historical Review, NCLR publishes poetry, fiction, and nonfiction by and interviews with North Carolina writers and articles and essays about North Carolina writers and the rich literary history and culture of the Old North State.The print issue is published annually in the summer. It is available via subscription and in independent bookstores across the state. Since 2012, a separate, open access online issue is released in the winter. A cross between a scholarly journal and a literary magazine, NCLR has won numerous awards and citations, including five from the Council of Editors of Learned Journals: the Best New Journal award in 1994, the Best Journal Design award in 1999 and 2010, the Parnassus Award for Significant Editorial Achievement in 2007, and the Phoenix Award for Significant Editorial Achievement in 2014.